AVON PARK, Fla. – April 11, 2019 – South Florida State College (SFSC) inducted 26 students into its Tau Epsilon chapter of the Phi Theta Kappa honor society on Friday, March 29, at the SFSC University Center Auditorium on the Highlands Campus. The PTK inductees were: Alejandra Alejo, Tina Barkley, Yanette Burmudez, Savanah Connolly, Erika Cruz, Gabriel Dezzeo, Robin Dodd, Julia Espinoza, Nicholas Fisher, Margarita Flores, Gabriela Garcia, Malak Haifa, Debbie Lambert, Marie Maclean, Natalie Manjarres, Carly Mofield, Enrique Moreno, Nancy Morissey, Saray Perez, Brenda Rosas, Olivia Smith, Alyssa Strength, Adriana Somma, Hayley Thompson, Jocquas Walker, and Angel Vigil. With families, fellow students, and college administrators looking on, the students recited an oath of membership, joining the honor society that recognizes distinguished academic achievement by students in two-year academic programs. As the ceremony drew to a close, each inductee stepped forward to sign the honor society’s membership book and record their status as a scholar of distinction at SFSC. As the auditorium lights dimmed, the scholars each lit a candle to signify their fellowship in the society. 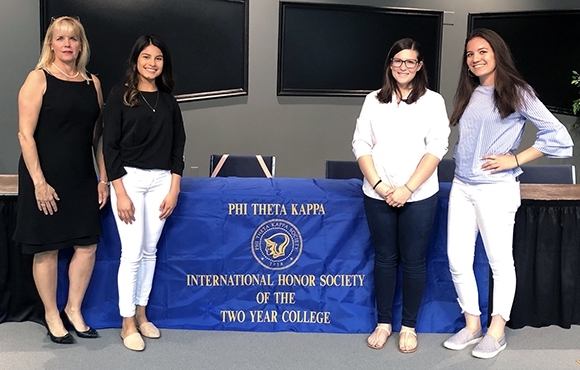 PTK is an honor society that recognizes the academic achievements of community and state college students and helps them to grow as scholars and leaders. The society is made up of over 3.5 million members and nearly 1,300 chapters in nine nations. In 2018, PTK celebrated its 100th anniversary. For more on PTK, visit ptk.org. For more information about SFSC’s PTK chapter or Honors Program, contact Dr. Charlotte Pressler at 863-784-7247.